Robin Gordon Walker was born in 1911 and went to Wellington College in 1924, where he excelled academically and at sport. In 1932 he returned as a youthful and charismatic teacher. He and the chaplain Geoffrey How, both OWs, sought to bring a more liberal and enlightened attitude to College, a period which flourished under the headmastership of Bobby Longden, tragically killed by a bomb in 1940. Older masters were hidebound and rigid in their methods and many of the’ Old Guard’ Housemasters took exception to the move for change led by Robin and Geoffrey, who had a more relaxed view on friendships between boys and encouraged them to have friend in other Houses, a practice much frowned on. The ‘Old Guard’ made repeated appeals to the Headmaster, WH House, to intervene. In 1943 Geoffrey was dismissed by House and Robin resigned in protest. He died tragically young in 1947. 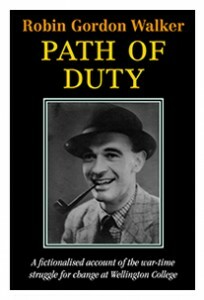 Robin wrote a novel in 1944 fictionalising the events that took place at Wellington. All the names and places were changed, but the essence of his story rings true to all who know about this period in the history of the College. It is an important and timely publication: the conflicting attitudes are portrayed with skill and the denouement is moving and powerful.